Home > Onboarding Portal > How do my members get charged? How are my members charged for their subscriptions? Members are charged for their subscriptions differently depending on their payment plans and payment methods. Members with an automatic payment method will be managed differently than members without autopay. Who are members with auto-pay? Auto-pay members will have the blue circular arrow symbol in their account. How are members with auto-pay charged? *!﻿Click here to learn about the 3 things that must be in place in order for a member with stored payment information to be charged.*! Seasonal Payment Plans: Members with seasonal payment plans will be automatically scheduled for future pending payments. Once the date of the scheduled payment passes, the system will initiate the automatic charge. Ongoing Payment Plans: Members with ongoing payment plans will be charged according to their payment plan each time that their balance reaches the preapproved amount. Once their balance reaches this amount, the system will initiate the automatic charge. For example, if a member signed up to pay for 3 distributions at a time, they will be auto-charged for 3 more distributions once their balance reaches $0. How are members without auto-pay charged? Seasonal Payment Plans: Members with seasonal payment plans will be scheduled for future pending payments. Once you receive a member's payment, you can manually update the status of the payment from Pending to Received in order to credit their account. Ongoing Payment Plans: Members with ongoing payment plans will have their account balance debited for each distribution that is recorded as delivered. Members will continue to be scheduled for delivery according to the schedule of their subscription even if their balance is $0. You should monitor for members with $0 or negative balances and follow up with them to ensure that they add money via the Pay link or via a manual payment method. 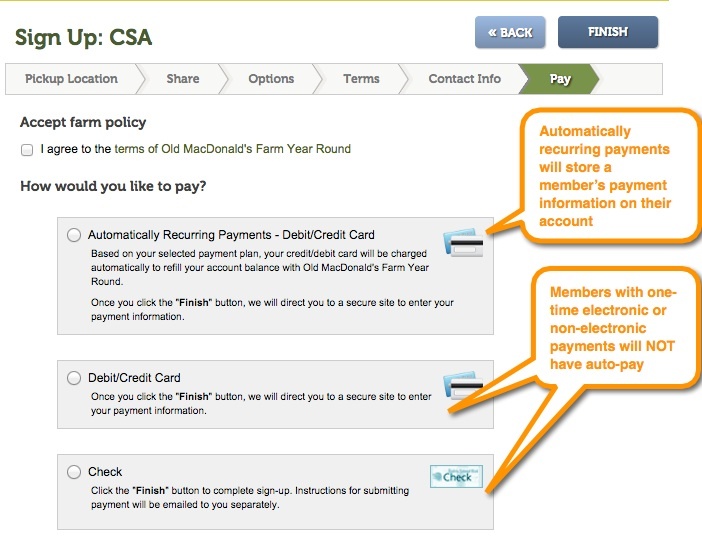 Once you receive a member's manual payment, you can manually add a payment to credit their account.